In The Wine Dark Sea, the Captain and the Doctor discuss the structural reasons for the flying skill of the frigate bird (Fregata magnificens, aver. length 40 in., aver. wgt. 3 lbs.). Although frigate birds fly far out to sea, they stay near their home islands. Their feathers are not waterproof, so they rarely, if ever, land on the sea. 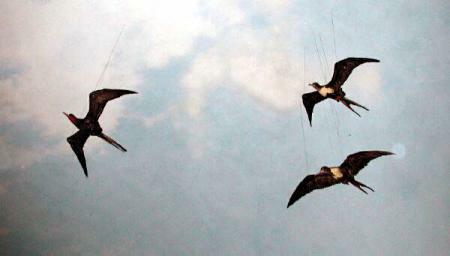 They spend their time in the air, hunting for flying fish. Their flying skills are so advanced that they can attack other sea birds in the air, forcing them to regurgitate their catches. The frigate birds are then able to dive below and retrieve the food before it falls into the sea. Their large wingspan (over 7 feet) enables them to ride the wind without effort, but makes it difficult for them to land. Now it is time to see some animals from under the water.